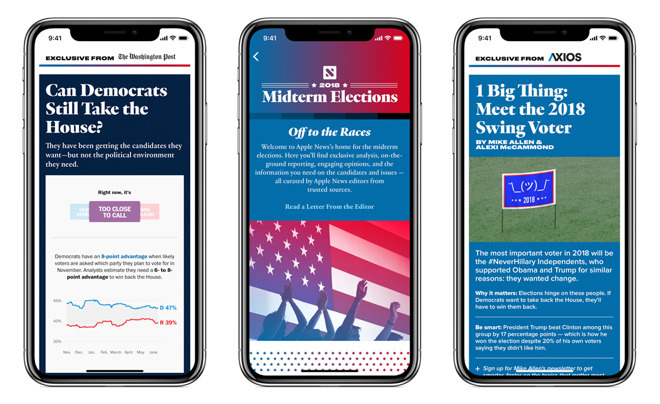 Billed by Apple as a "new resource for timely, trustworthy midterm election information," the section will attempt to help users see the "most important reporting and analysis from a diverse set of publishers." Stories included in the section will be curated by Apple News editors, combining breaking news alongside highlights and analysis pieces. Apple News will present coverage from Fox News, Vox and other publishers. Other features include, but are not limited to The Washington Post's "Election Now" dashboard and survey data, a weekly briefing from Axios, and Politico's "Races to Watch" examinations. As well as focusing on "well-sourced fact-based stories," the Midterm Election section will include special features under two areas. The Conversation will collect together opinion columns about hot-button issues, while On the Ground will highlight reporting on issues that are important to local constituents in major electoral races. "Today more than ever people want information from reliable sources, especially when it comes to making voting decisions," said Apple News editor-in-chief Lauren Kern. "By presenting quality news from trustworthy sources and curating a diverse range of opinions, Apple News aims to be a responsible steward of those conversations and help readers understand the candidates and the issues." The 2018 Midterm Elections section can be accessed within Apple News via the new banner at the top of the "For You" tab, as well as the Top Stories and Spotlight tabs. The new electoral section launches while Apple News is featuring stories about the World Cup, coinciding with the soccer tournament which will run until July 15.